by Averica Discovery Services, Inc. Contracting tough projects with a CRO always requires active management, but some projects are complex enough that scope creep is a common problem. Impurity isolation falls into this category – the target impurity is an unknown, present at an uncertain level in a sample, and may not be stable. It’s a fun problem for the analytical team, but a headache for a project manager. Begin with a tight definition of the goals. Think of all the questions you should consider. Which impurity/impurities? What other feedstocks might serve as a supply? Is it present earlier in the synthesis? Is it likely a related substance, or something else? Will you need to fully determine its structure? Do you have any mass spec or UV spectral data? What is your timeline? This is not a complete list, and every project differs. But, putting all the questions on the table starts the path to a clear definition of scope. When it comes to your compound, your team are experts. Your synthesis conditions, past results and data, and methods can give the CRO a head start as they narrow in on the ideal impurity isolation method. Now bring the CRO scientists into the discussion. Look for a resourceful group with strong analytical development expertise. Create a combined team to go over the technical challenges. This gives you the best chance to develop a controllable strategy and define the scope and deliverables. At the CRO, work begins by transferring in your method and confirming that analytically they see the conditions your team described. At Averica, we designate the first phase of all our impurity isolation proposals as “technology transfer”. Your methods are reproduced in our lab (or redeveloped if needed), shown to be stable and robust, and possible feedstocks examined for specific impurity content, before isolation work begins. Technology transfer work often reveals new information that can improve the overall process. 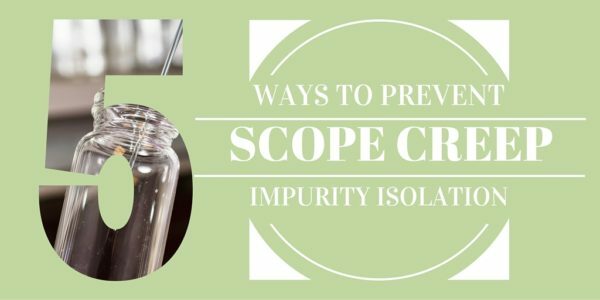 The tech transfer phase should inform all isolation work so that scope creep during the impurity isolation and structure elucidation phases is rare. We often use this phase to evaluate useful feedstocks and methods, aiming to control the “gotcha” moments in advance. One of the hardest things to control is a scientist’s innate desire to answer a question that pops up through investigation. Identifying those unresolved questions early allows your team to make a choice of which ones to pursue – and to ignore those that really aren’t important to the problem at hand. Plan for a continuous joint evaluation of data. For example, new impurities, reactive impurities, and method improvements often grow out of the consideration investigation of the relationship between the impurities and the synthetic or storage conditions of the sample. Ideas and discussions will be exchanged that may change the scope of the project. With the entire team present, informed decisions about whether to ignore or pursue these can be made and quickly enacted. Mass Balance – What, When, How? Averica Answers: Can You Capture a 0.01% Impurity? Averica Answers – What is Averica’s Approach to Impurity Isolation? Method Development and Validation – Are We Doing It Right?